Reed Farms at Comanche, Texas has been in the farming and ranching business for over 58 years. With retirement we wanted something that we could do together and that would be profitable. After much research we decided to start a Royal White® Hair Sheep flock. Through reproduction and with the purchase of additional animals to increase the genetic pool the flock continues to grow rapidly. Our first 5 years were spent selecting breed characteristics for flock enhancement and we continue this practice as part of our flock management. We have also improved management through monitoring stocking rates, heard health, predator control and record keeping. We are members of the Royal White® Sheep Association, North American Hair Sheep Association, Texas Farm Bureau and work closely with Texas Agriculture Extension Service. Continuing education keeps us abreast of the latest management improvements regarding farming, ranching and sheep. 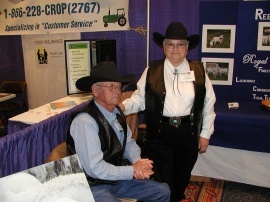 Flocks in Comanche were certified by Royal White LLC in 2007.